Version 8.12 of KioWare for Windows (Lite, Basic, & Full with Server) has added new toolbar controls, support for time-limited sessions, Hot Virtual Keyboard support, and support for Chromium 62. KioWare Basic for Windows has added a support for Puloon Bill Dispensers, Custom KPM printers, an Elatec proximity reader, and more. This version adds support for setting max time for each user session, new toolbar controls, hot virtual keyboard support, support for an array of new devices including cash dispensers, acceptors, barcode readers, and more. 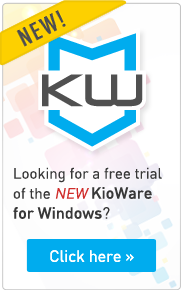 Version 8.12 of KioWare for Windows is available in models Lite, Basic, and Full with Kiosk Management. New Features of KioWare Lite for Windows include the following; KioWare now allows you to set a max time for each user session. Time limited sessions have been an often-requested feature from customers and prospective customers. In the attract/inactivity tab, check the box to turn on time limited sessions. New toolbar controls have been added to allow for configuring the custom KioWare toolbar to show data and/or time. A new toolbar control has also been added to indicate connection type. There is also a new toolbar option that accompanies the time limited session feature. Add custom toolbars in the user interface tab. The new items have been added to the toolbar editor under toolbar controls. The Hot Virtual Keyboard is now supported, adding a number of attractive and trendy virtual keyboard options to the KioWare interface. To add the Hot Virtual Keyboard, Select “Use Hot Virtual Keyboard” from the Virtual Keyboard dropdown located in the User Interface tab.